Rent one of our unique spaces for your next event or meeting. A flexible outdoor setting for your wedding, cocktail party, corporate event, graduation party, anniversary celebration, and more! The “mainstage” in the Bertha Krueger Reid Theatre is ideal for musical performances, lectures, wedding ceremonies, and presentations, and cinema. Professional sound and lighting equipment make the mainstage a winning venue. Designed with a center section and two wings, there is not a bad seat in the house! More than a traditional “lobby”, this hip, bold area easily transforms for your wedding, cocktail party, birthday bash, holiday celebration, and more. With large windows offering natural light, lake breezes, and beautiful views. The Lobby can host seated dinners, standing cocktail receptions and so much more. This flexible space is ideal for corporate meetings, bridal suites, presentations, and workshops. 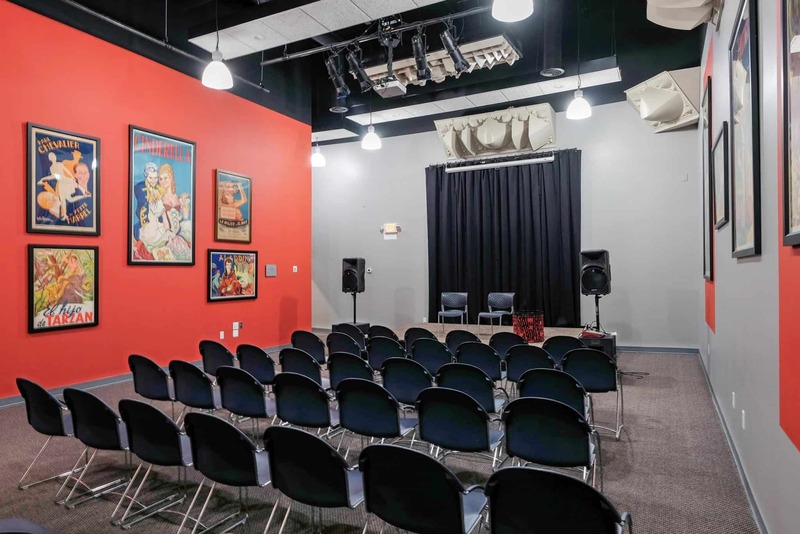 The Performance Studio is acoustically balanced with professional sound and lighting to create an intimate venue ideal for smaller performances and cinema. Our Studio is also well suited for meetings, presentations, and creative sessions. Flexible furniture and staging allow for a wide variety of settings. A creative space for artist retreats, classes, and birthday parties. Or still have some questions? Get in touch.